Although Kefalonia is a good island just for lounging on its beautiful beaches, there are also plenty of other things to do and see. The main town has a good Archaeological Museum and an excellent Historical and Folklore Museum both well worth seeing. The seafront also makes a pleasant place to stroll, and to have a meal in one of the restaurants with waterside tables. Assos is one of the most attractive little towns on the island. It’s just north of Myrtos Beach and there’s a good view of Assos and its 16th-century Venetian fortress from the main road. Don’t drive on, though. 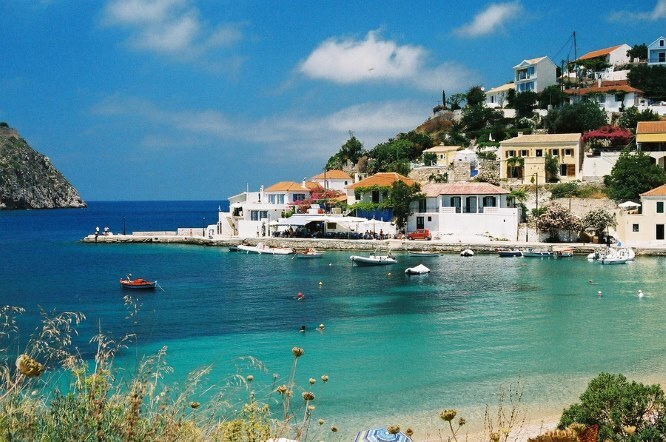 Instead, drive into Assos and you’ll discover a pretty and laid-back fishing village, well worth seeing. Steep steps lead down into this network of caves, with the main chamber being so large and with such good acoustics that in summer concerts are held inside it. This small town and port at the north end of Kefalonia is the prettiest place on the island. It was fortunate to survive the huge 1953 earthquake which destroyed many of Kefalonia’s old buildings, so its pretty coloured 18th-century mansions give a glimpse of the way the island used to be. 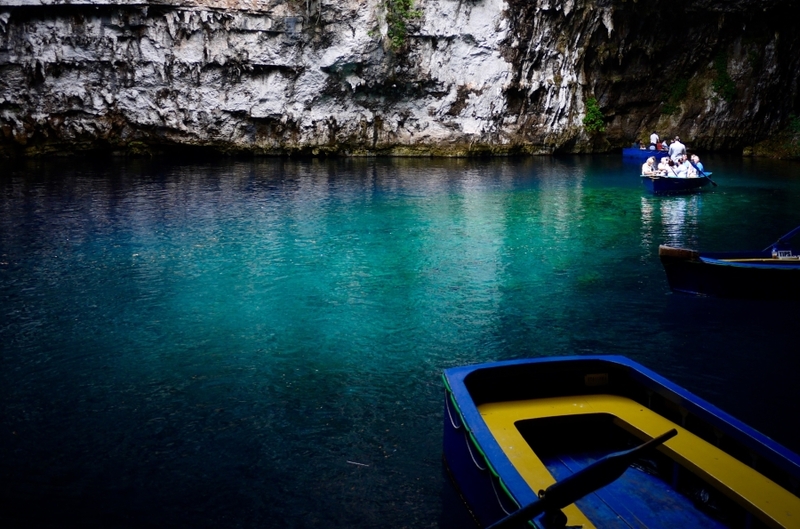 The Melissani Cave, not far from the Drogarati Cave, is visited by walking down to a small jetty where you then take a boat out onto the underground salt water lake that now fills the cave. The roof of the cave fell in many years ago, and it’s a strangely haunting feel to sail over the lake and see the changing colours. 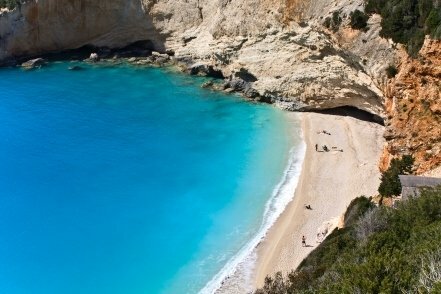 Myrtos is the most famous and most photographed of Kefalonia’s many beautiful beaches. Naturally this means it gets crowded at busy times of the year, but it’s still picturesque with the waters here somehow seeming a deeper shade of turquoise than anywhere else. 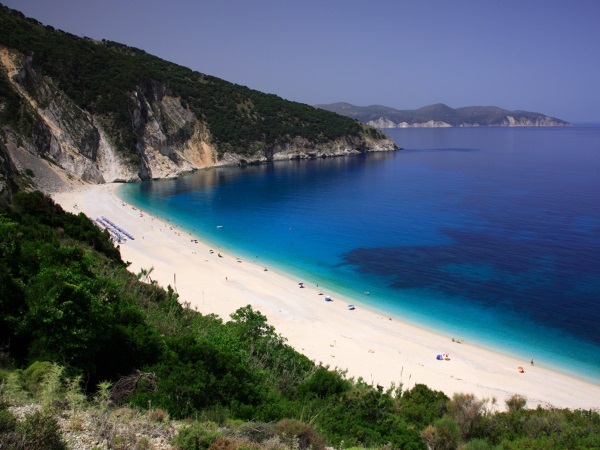 Take a look at our main Kefalonia page for information on how to get there.